It’s a new year, and the world has its first new species of shark in 2019. Meet Carcharhinus obsolerus! Though, it’d be wise to temper your expectations if you hope to see the newly-described species in the wild. The unique shark—described based on a few specimens caught many decades ago—may actually be extinct, gone before it was ever named. Between 1897 and 1934, three very young sharks were caught in Vietnam, Borneo, and Thailand, and found their way into museum zoological collections. The sharks had long been recognized as a bit unusual, and difficult to categorize as known shark species. Peter Kyne, a shark conservation biologist at Australia’s Charles Darwin University and coauthor on the recently-published paper describing the new species, said that some researchers had considered the mysterious specimens to be the smalltail shark. But smalltail sharks are found in the Americas, an entire ocean away. “This unlikely distribution pattern for a small coastal shark led others to question that relationship, and suggest that the Asian specimens represented a separate, as yet undescribed species,” Kyne told Earther. To determine how unique the long-dead sharks were, Kyne and his colleagues needed to compare the pickled predators with what appeared to be the most similar species alive. The team carefully examined and measured key physical features of the specimens and several other species, including the shape and count of their teeth and the placement of the fins. The researchers even used x-ray imaging to compare characteristics of the sharks’ cartilage skeletons. They found that the three preserved sharks were different enough from their close cousins to warrant classification as a totally new species. Since the species apparently hasn’t turned up anywhere since the 1930s, Kyne and his colleagues offer the grave possibility that the shark went extinct sometime in the past several decades. 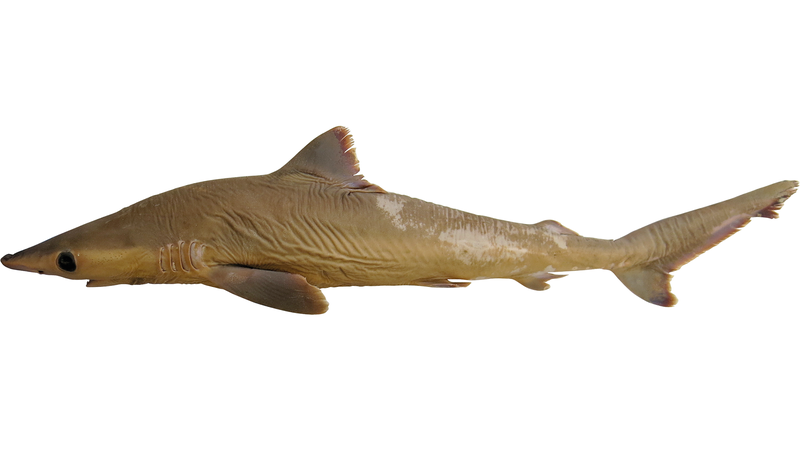 The researchers have even built awareness of the shark’s less-than-promising conservation prospects into its species name: “obsolerus” is Latin for “extinct.” They proposed the English vernacular name of “lost shark” in the new PLOS ONE paper; a species gone before we even knew it. Piling on the lost shark’s grim odds is its apparent home of shallow, Southeast Asian coastal waters, which are subject to intense, mostly unregulated shark fishing activity. That said, even after nearly a century of absence, there’s still plenty of reason to hope for the lost shark’s return. Some of the lost shark’s closest kin have pulled multi-decade disappearing acts before, only to resurface again. David Ebert, an ichthyologist and shark specialist at California State University’s Moss Landing Marine Laboratories not involved with the study, notes that two Carcharhinus species in particular have incredible re-emergence stories. The smoothtooth blacktip shark (Carcharhinus leiodon) was known from a single specimen caught off the coast of Yemen in 1902. The species wasn’t even named until 1985, and was considered likely extinct, if even a valid species at all. Then, in 2008, the shark miraculously popped up in a fish market in Kuwait, some 3,000 kilometers away. Ebert says that having a formal description for the species played a crucial role in its rediscovery. There’s also the Borneo shark (Carcharhinus borneensis), described in 1858 from a single specimen near the eponymous Indonesian island. A few more were seen sporadically until 1937, but then it disappeared until 2004, when it was spotted at—where else—a fish market. But there are also sharks that have seemingly vanished, with no triumphant return in sight yet. Sharks like the Pondicherry shark (Carcharhinus hemiodon), ultra-rare since its 1838 discovery in Indian waters, have gone entirely unreported since the 1970s. Ebert says that now that the lost shark is formally described as a real, unique species, it has a better chance of being recognized as such in any chance future encounters. Kyne did say that it is possible the lost shark still patrols the coastal waters of the South China Sea. For now, conserving any populations that may exist requires a practical, systematic approach, like evaluating the species’ extinction risk for the IUCN Red List of Threatened Species. It’s sharks like Carcharhinus obsolerus and its relatives—small, somewhat nondescript coastal sharks in heavily-fished regions—that Ebert warns should be watched more closely. High-profile species like makos, threshers, and white sharks get a disproportionate amount of conservation interest, said Ebert, but little sharks lower in the food chain are the “proverbial canaries in the coal mine,” and few folks are keeping tabs. Whatever the lost shark’s ultimate fate, it assuredly won’t be the newest shark on the block for long. New species are being described at a breakneck rate. Ebert notes that more sharks and rays have been discovered in the last 39 years than in the previous 200. Perhaps some of these animals can be revealed and protected before they become “lost” too. Correction: This article has been corrected to note that Carcharhinus obsolerus was first found in Yemen in 1902, not Kuwait as originally stated.